There are many infectious emergency diseases of pigs that do not occur in Australia. Keeping these diseases out of Australia gives us a market advantage and allows us to export pig products widely. An outbreak of one of these diseases could severely restrict our trading opportunities and cost millions of dollars in lost production and disease control. The most important pig diseases not present in Australia are foot-and-mouth disease, classical and African swine fever, swine vesicular disease, vesicular exanthema and vesicular stomatitis and Japanese encephalitis. Why must you report an emergency pig disease? Anyone in Western Australia who suspects that their animals have an emergency disease is legally obliged to report it to a Department of Primary Industries and Regional Development, Western Australia (DPIRD) officer as soon as possible. When should I suspect an emergency pig disease? What should I do if I see unusual disease signs or unexpected deaths in my pigs? Call your private veterinarian or a DPIRD veterinarian. Call the Emergency Animal Disease hotline, which operates seven days a week on 1800 675 888. Foot-and-mouth disease is a highly contagious viral disease of cloven-hoofed animals, including pigs, sheep, cattle and goats. Other common farm animals, such as horses, poultry, dogs and cats cannot catch foot-and-mouth disease. Foot-and-mouth disease is not the same as hand, foot and mouth disease in people. Signs of foot-and-mouth disease vary depending on the species infected and the strain of the virus. 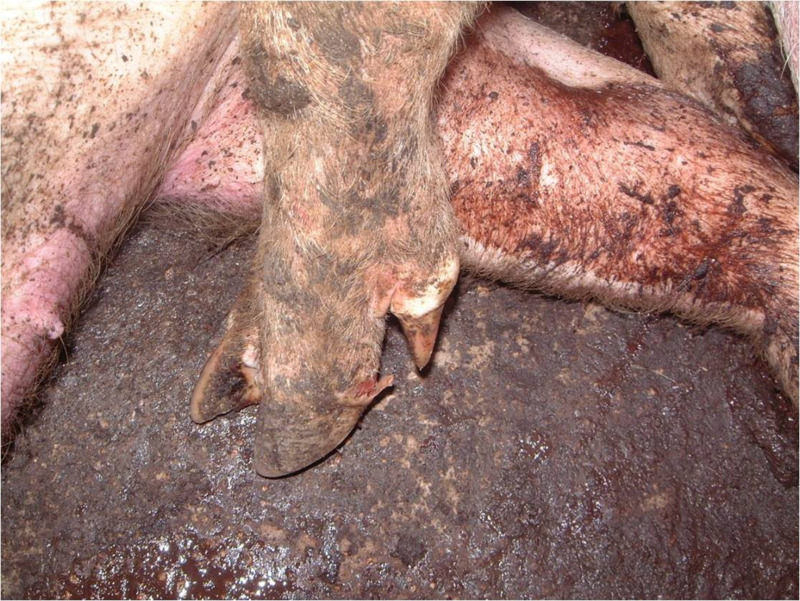 Blisters form in the mouth, nostrils, on teats, and on the skin between and above the hoofs of cloven-footed animals. Foot-and-mouth disease reduces productivity and may kill young animals. Note that in sheep the signs are often mild and difficult to see and lameness may be the only visible sign. Animals usually show signs of foot-and-mouth disease within 3–5 days of infection, but signs can take up to 14 days to appear. Infected animals spread the virus before they show signs of the disease. See the webpage on recognising foot-and-mouth disease signs for more information. The sooner foot-and-mouth disease is recognised and reported, the sooner its spread can be stopped. The Australian Bureau of Agricultural and Resource Economics and Sciences (ABARES) estimates that a large, multi-state outbreak of foot-and-mouth disease would cost the Australian economy up to $52 billion over 10 years. Minimising the spread of the disease through early detection and reporting will reduce the devastating economic and social costs of an outbreak to livestock producers, the livestock and regional industries and the national economy. The most likely way that foot-and-mouth disease could enter Australia is by the illegal importation of meat and dairy products, which can carry foot-and-mouth disease virus. Pigs are highly susceptible to foot-and-mouth disease and can become infected if they eat products carrying the virus. Once infected, pigs produce large quantities of virus, which can spread to other livestock. has had contact with meat, meat products or any other products from mammals. See the webpage on prohibited pig feed for more information. Foot-and-mouth disease is widespread throughout the world. It is common in many countries of Africa, the Middle East, Asia and South America. It has not occurred in Australia for more than 130 years. In addition to foot-and-mouth disease, there are three other important diseases not present in Australia which cause blisters (vesicles) in pigs: swine vesicular disease, vesicular exanthema and vesicular stomatitis. These are serious diseases in their own right and are important because they closely resemble foot-and-mouth disease. If there were an outbreak of one of these diseases in Australia, it would be crucial to find out which disease it is as quickly as possible. Swine vesicular disease and vesicular exanthema are most likely to be introduced by feeding illegally imported pork products. Vesicular stomatitis also affects cattle, horses and humans and is spread by direct contact with infected animals, insects and contaminated feed or water. Classical swine fever and African swine fever are both highly contagious viral diseases, affecting only pigs. The diseases are similar, although they are caused by different viruses. The chronic form of classical swine fever occurred in Australia in 1962. African swine fever has never occurred in Australia. The most likely way that these diseases would enter Australia is via feeding illegally imported pig meat or other pig products to pigs. The disease then spreads between pigs through contact with faeces, urine and other discharges or through use of contaminated equipment, vehicles and clothing. Ticks can also spread African swine fever. Japanese encephalitis is a mosquito-borne viral disease of pigs, horses and humans. It causes encephalitis in humans, with a death rate of 25%. Half of those who survive Japanese encephalitis suffer permanent brain damage. Japanese encephalitis is present in many regions north of Australia, including Papua New Guinea and the Torres Strait Islands. In far north Queensland, pigs and horses have developed antibodies to the disease which means that some must have been infected in the past. Water birds (herons and egrets) carry the virus without any sign of disease. Mosquitoes transmit the virus to pigs, horses and humans, particularly during monsoonal seasons. In pigs, there are usually no signs of infection with Japanese encephalitis. However, pregnant sows may abort or produce weak, stillborn or mummified piglets, and young piglets may show neurological signs.